Like last week’s film, Invasion of the Body Snatchers, this 1951 film, directed by Robert Wise, stands out from the pack of the science fiction/horror movies of its time by being different in a couple of key ways. In this pre-ET era environment, it shows the alien from another world as a sympathetic character, and earth’s scientists as the world’s possible saviors. 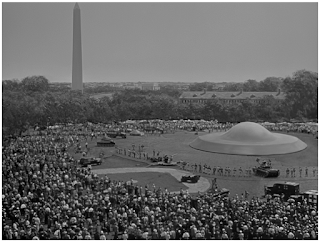 The film opens with a flying saucer floating over Washington, D. C., with the eventual Psycho composer Bernard Herrmann’s eerie vibrating score in the background. The audience sees the impressive buildings and monuments of the American capital, and there may be a feeling of pride in the country’s citizens as they see what the nation has accomplished, ironically, here, in a place built by those from distant lands. However, this feeling of superiority diminishes as the spacecraft lands near the White House. The first response of earth’s government is to roll out the police and the army, with its soldiers and tanks. 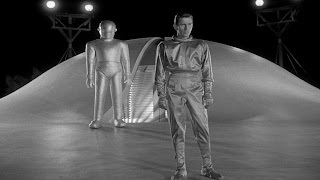 When the alien visitor, Klaatu (Michael Rennie) emerges, he announces that he comes “in peace and good will.” He opens a small, strange-looking device. 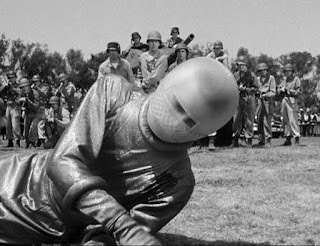 A nervous soldier shoots Klaatu in the arm and the device is destroyed. 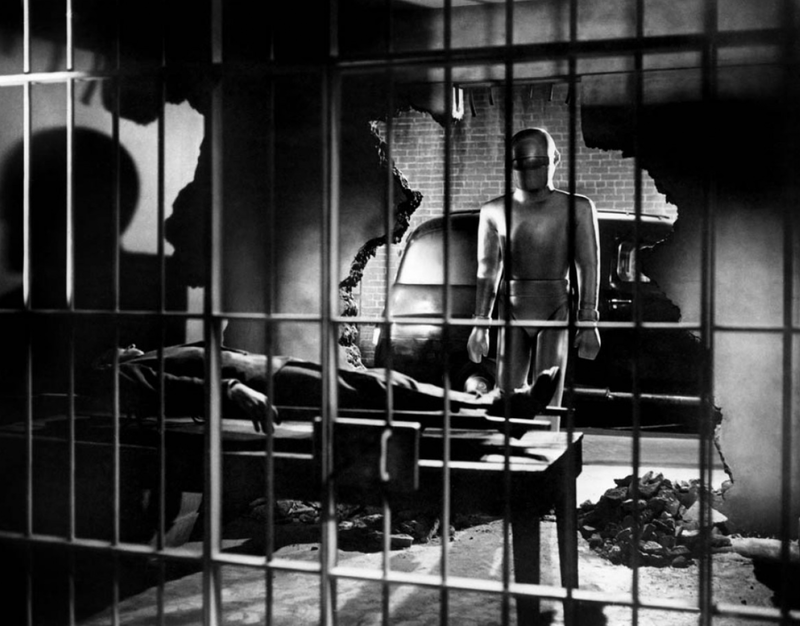 In response, Gort (Lock Martin), a tall robot, emerges from the ship and destroys the military’s weapons with a ray emanating from his helmet-like head, without harming the soldiers. 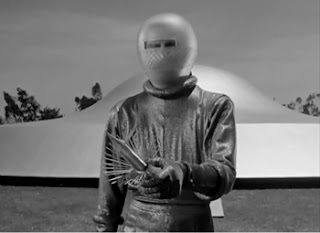 Klaatu orders him to stop and explains that the object he brought was a device to view life on other planets, and was a gift for the President. The human reaction here is not to respond to the overture for peaceful relations with acceptance and hospitality, but to go on the offensive by giving in to paranoia and assuming the worst will occur. The unknown many times frightens people, and instead of trying to discover its qualities, there is a tendency to respond with fear to the possible threat to the status quo. Here, before even knowing what the alien’s device is, the soldier destroys it. It is significant that the gift was to facilitate the observation of other races, and thus the chance to reveal and understand those different from ourselves. This metaphor can be seen as relevant today, as the response to foreigners is sometimes met with the bigotry that flows from xenophobia. In the movie we hear press announcements as people irrationally begin to panic and give in to hysteria. There is a news statement that the military “has taken every precaution,” which is an inflated prideful attitude, since it is impossible to be prepared for every contingency. Hubris feeds the human tendency toward being narrow-minded. This inclination is even illustrated among the medical profession in the movie. 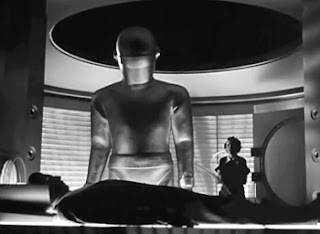 After Klaatu is taken to the Walter Reed Medical Center, the doctors there find that he has the health of someone in his late thirties by earth’s standards. However, Klaatu informs the doctor that he is in his seventies and life expectancy is a hundred and thirty on his world. 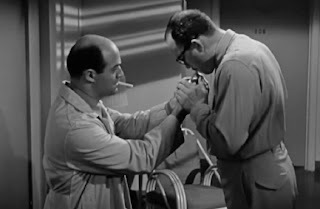 One military doctor asks the other, “How does he explain that?” as he accepts a cigarette from the other. The ignorance of the statement is emphasized, even in 1951, by medical professionals who question how to have good health while they take poison into their bodies. Klaatu’s viewpoint is cosmic, while those of the earthlings is selfish. When he breaks out of the hospital, he does so because he wants to find out about humans; he acts to understand why the response to him has been hostile. However, the earth people respond to the unknown with fear and suspicion instead of curiosity and openness. 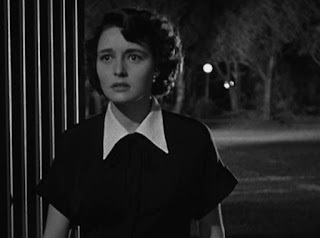 This human reaction is illustrated when Klaatu enters the boardinghouse. The radio is on and the media are adding to the irrational fears of the people. The residents of the house see a man in the shadows of the entry way, and their immediate response is fear. This reaction is the same as the soldiers’ at the beginning of the story, because Klaatu’s face is hidden by a space helmet. Once Klaatu walks into the light, once he is seen, they all relax. Understanding wards off jumping to irrational conclusions. (Klaatu takes on the name of “Carpenter.” Is he trying to build an alliance between his world and this world? Is he, like Jesus, the son of a carpenter, trying to save earth’s people?) When the secretary from the President’s office, Mr. Harley (Frank Conroy) wants the alien to tell him his message meant for all earth’s countries, the government representative sounds self-important. As the rejections from all the world leaders pour in because they are so self-centered as to want the meeting to take place at each ruler’s home country, this human egotistical attitude is amplified. 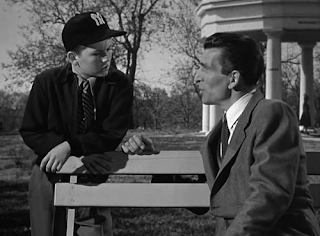 Harley says to Klaatu that he understands his impatience. Observing the pettiness of earth’s governments, the spaceman says, “I am impatient with stupidity. My people have learned to live without it.” To which Harley responds, “I’m afraid my people haven’t.” This exchange stresses how much further the people of this world need to evolve. There are those who comprehend the importance of this extraterrestrial visit. 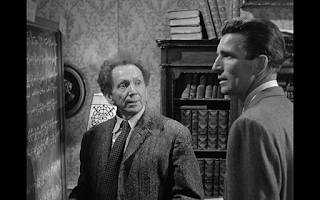 One of them is the eminent scientist, Professor Barnhardt (Sam Jaffe). 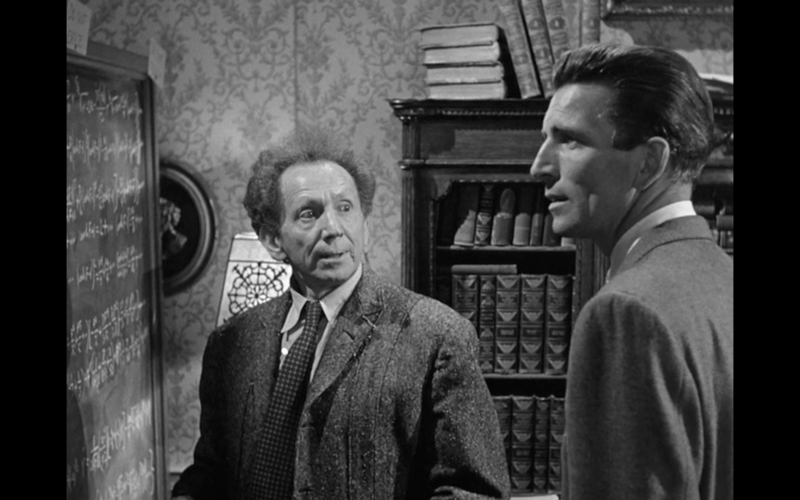 Klaatu visits his home while the scientist is away and helps him complete an involved mathematical equation by writing on the blackboard in the man’s study. The two are brought together because of science, the pursuit of knowledge. The scientist’s response is not to assume he already has the answers to an unknown situation, as do the hysterical press and masses. Barnhardt says “curiosity makes good science.” And, thus, he says he has thousands of questions. Knowledge opens the mind to possibilities; ignorance closes the door. It is significant that the housekeeper is ready to erase Klaatu’s notations until he stops her; again, we see the fear of anything new upsetting our mental apple cart. Here, as in Invasion, the scientists offer hope, not the horror of their discoveries gone wrong as in other films of the genre. But, it may be that the scientists must now atone for bringing on the possibility of nuclear devastation. Klaatu, again with the cosmic view, says to Barnhardt, that we are celestial neighbors, and if this planet’s violent ways become a threat to those living in outer space, then the threat must be eliminated. Of course, the use of the word “neighbor” brings the discussion down to earth. Since all of us here on this world, in a sense, are neighbors, we must stop being a threat to each other in order to survive. 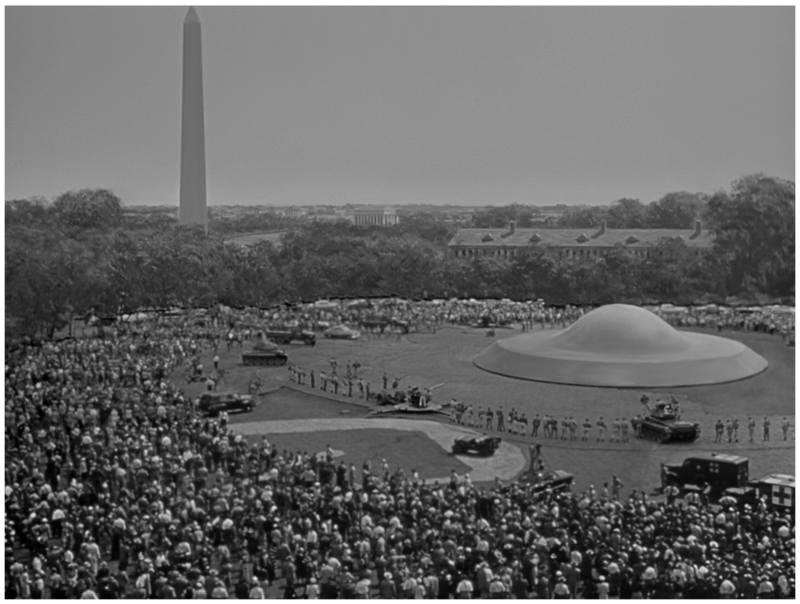 Barnhardt proposes that Klaatu’s message be delivered to the great scientists of the world who he hopes can persuade their respective nations to open their minds, and listen. He knows that it will be difficult to get through the threshold of resistance, so he asks the alien to dramatize the importance of his message with a demonstration of the power the nations of the world are facing if they do not comply with stopping the use of nuclear energy for destructive purposes. Klaatu neutralizes the electricity all around the world to show what power the people are up against, but this making the earth stand still is merciful, since it does not affect airplanes in flight, or hospitals. Another person we see who has an open mind is Bobby’s mother, Helen. Early on she says that it’s possible that the spaceman may be a good person. However, her boyfriend, Tom (Hugh Marlowe), only thinks of himself. He wants to ditch Bobby when it does not appear there will be a sitter to watch over the boy. He becomes jealous of the newly arrived Mr. Carpenter’s association with Helen. When Bobby tells his mother and Tom that he followed Klaatu to the spaceship, and saw him activate Gort and enter the craft, Tom is suspicious. 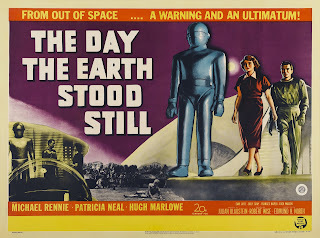 He finds out that the diamonds the alien gave Bobby were “not of this earth.” Klaatu finds out about Bobby’s tailing him, and, trapped in an electrical-neutralized elevator, explains to Helen who he is and what his mission entails. Helen tries to stop Tom from contacting the Pentagon. But, she is too late. She says how Tom’s actions are going to affect the rest of the world. His selfish, response is, “I don’t care about the rest of the world.” And then he says how she’ll feel different about him when he is seen as a hero and, “when you read about me in the papers.” The movie argues that it is this small-minded thinking that got the earth in the dangerous position it is in. Helen warns Klaatu, but on the way to find protection at Dr. Barnhardt’s home, he is shot and killed. He told Helen to give Gort a command so he will not destroy the earth. She confronts the robot, and, after she overcomes her initial irrational fear, she says the famous lines that prevent Gort’s attack from occurring: “Gort! 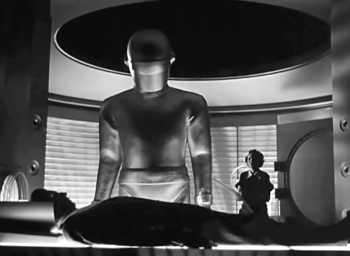 Klaatu barata, Nikto.” Gort retrieves Klaatu’s body and resuscitates it. The spaceman announces to the gathered scientists in front of the spacecraft that the universe grows smaller every day and that “there must be security for all, or no one is secure.” The peoples of the other planets agreed that there must be laws and policemen to guarantee that security. 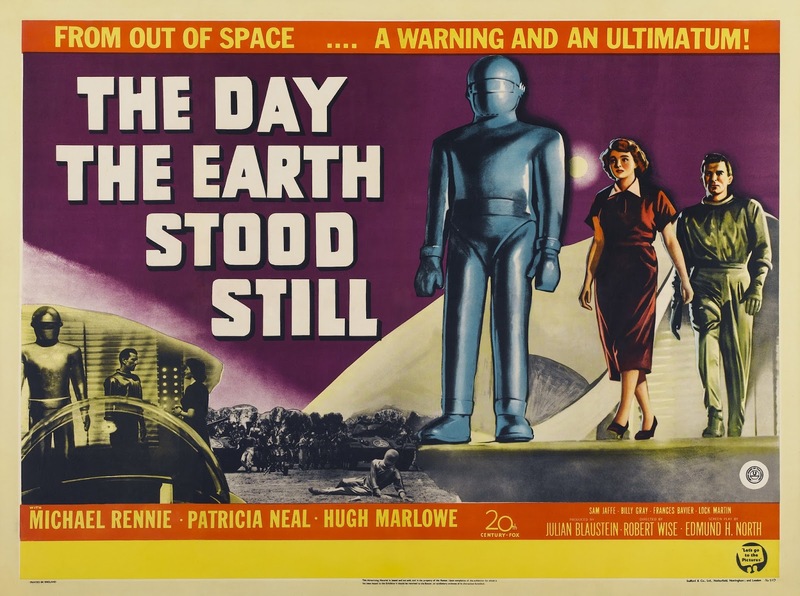 Robots like Gort have total authority to eliminate those who threaten the peace. There is freedom, except the freedom to act irresponsibly. They no longer have armies or wars. Klaatu says that they have not achieved perfection, but have a system that works. We of the present time may be suspicious of giving absolute authority to machines, and there are many films that warn against this abdication (the Terminator and the Matrix movies, among others). But, the argument against the catastrophic consequences of narrow-minded, self-centered fear makes this film timeless. The next film is The Spy Who Came in from the Cold. What is most interesting to me is viewing Klaatu and "Day" in terms of being a parable of Christ's coming to earth...including a "resurrection" scene. Excellent comment. Yes, that is why I think it is significant that the name he assumes is "Carpenter," a definite reference to Christ. Just like God he arrives from the heavens, and tries to save humanity, like Jesus. 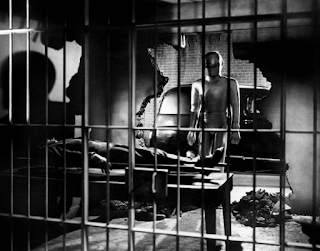 Could Gort be considered an archangel?